The GLOBE solar light broadcasts up to 12' of soft white light from a compact light body. Great light for entrance and pathway illumination. Easy to install. Automatically turns on at night. Loved the world over, The Globe features 18 natural-white LEDs, is 20" tall, the head is 11" diameter, and the base is 8" x 7". Get yours now. The GALAXY column mount solar light offers lots of light from a very small footprint. 4pcs of 1W top mount solar panels quickly charge the efficient Li battery. The light has a power switch for vacation mode. Automatically turns on at night and stays on for up 12 hours. Easy installation with only 2 screws. The base is under 7" wide, so it can mount onto posts/pillars as small as 8". Installs in seconds, brightens for hours, lasts for years. Buy it now. Classic styling for our newest solar light. Cast aluminum construction with frosted glass lenses. Using a 8W solar panel to power the light, the 36 super-bright LEDs offer lots of light for 8 hours per night. Based on the hugely successful Colonial 1 courtyard, Colonial Post Mount is equally popular. Click to order. The BEACON: Perfect solar light for the darker areas around the house. The shorter stature of this super bright solar lamp, keeps the light lower to the ground. Whether installed on your sidewalk, stairs or garden, 'The Beacon' will illuminate your path with unrivaled light output. This rugged, versatile SOLAR "mushroom" has too many applications to begin to list. Great light for brick columns at the end of your driveway. Raising the light higher from the ground gives a much larger pool of light. Become the beacon of light in your neighbourhood. Order now. 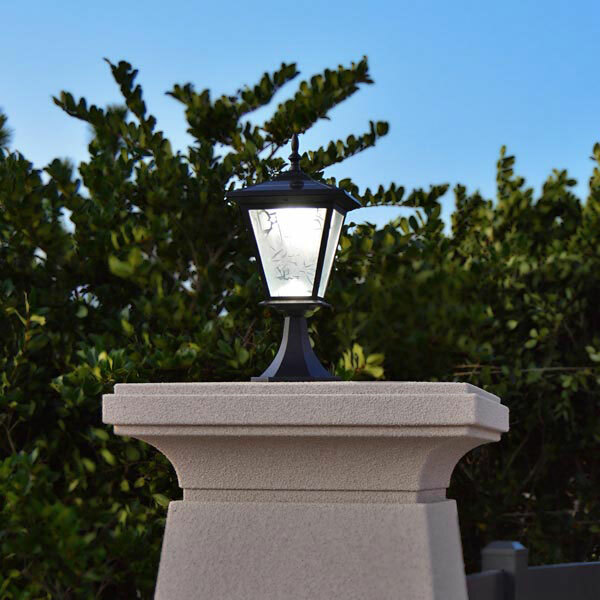 Browse all the free-light solar lighting designs for brick columns, posts and pillars today!